Working for domestic and commercial clients throughout Kent, London, the M25 Corridor and the Home Counties, we provide the complete property maintenance service, offering everything from domestic extensions to commercial refurbishments and office fit-outs. Meeting challenging requirements and ensuring your property looks as professional and attractive as possible is something our experienced and highly skilled builders thrive on. 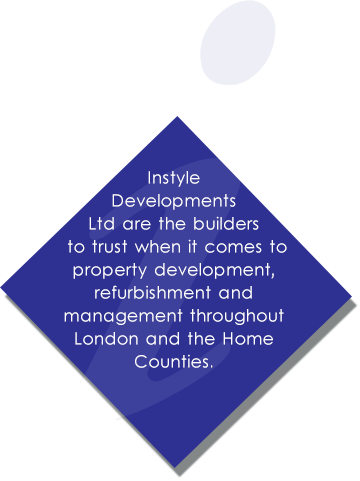 We take on property maintenance projects of all sizes, so no matter what work you need carried out, the experts at Instyle Developments are here to help. Call us today on 020 8300 8200 to arrange your free survey and no obligation quotation with one of our friendly and dedicated builders. Our highly skilled and expert builders have been providing first class property maintenance services for decades. Ensuring absolute quality in everything they do, and overseen by our dedicated project manager, our builders are the reason why Instyle Developments have become one of the South East’s leading building and property maintenance companies. Based in London, we provide comprehensive property maintenance and refurbishment services to commercial and domestic customers throughout Kent, London and the Home Counties, including Stratford, Orpington, Chelmsford, Reigate, Colchester, Redhill, Enfield, Chelsea, Victoria, Romford, Barnet, Bromley, Lewisham, Stevenage, Putney, London, Guildford, Watford, Kensington, Greenwich, Croydon, Slough and Islington. For further information about our property maintenance services, please contact us. One of our friendly team will be on hand to answer any questions and arrange your free survey and no obligation quotation.